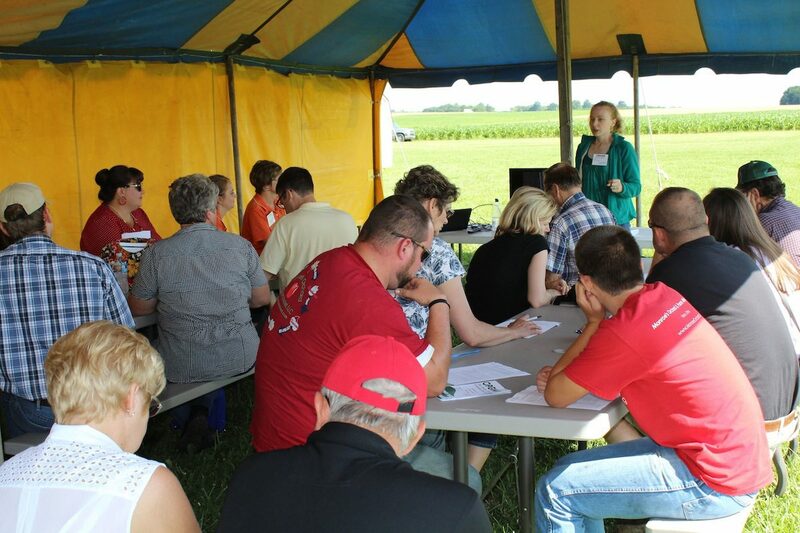 WOOSTER, Ohio — There was a strong sense of creativity and innovation at this year’s summer field day of the Ohio Produce Growers and Marketers Association. 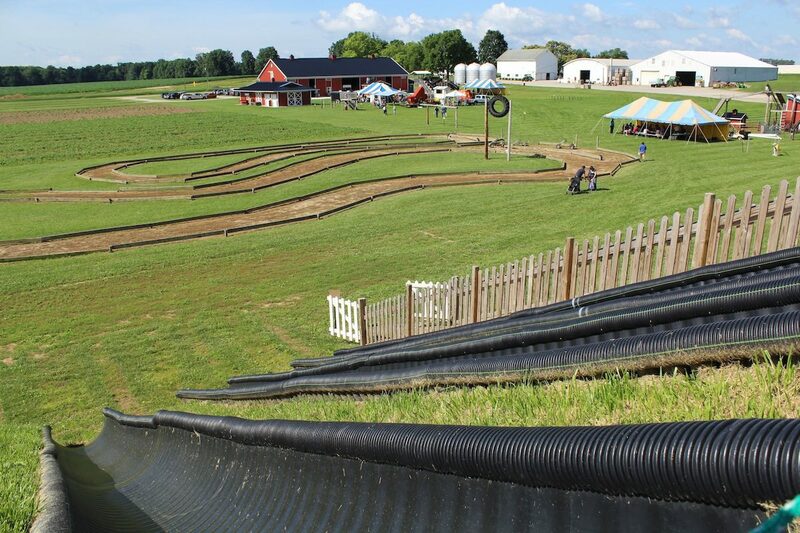 Both tour stops — located in Wayne County — featured farms that have made substantial investments over the past few years, to facilitate more events and customer outreach. First was Ramseyer Farms — a 700-acre crop and specialty crop farm that is known for potato production, and especially agritainment. 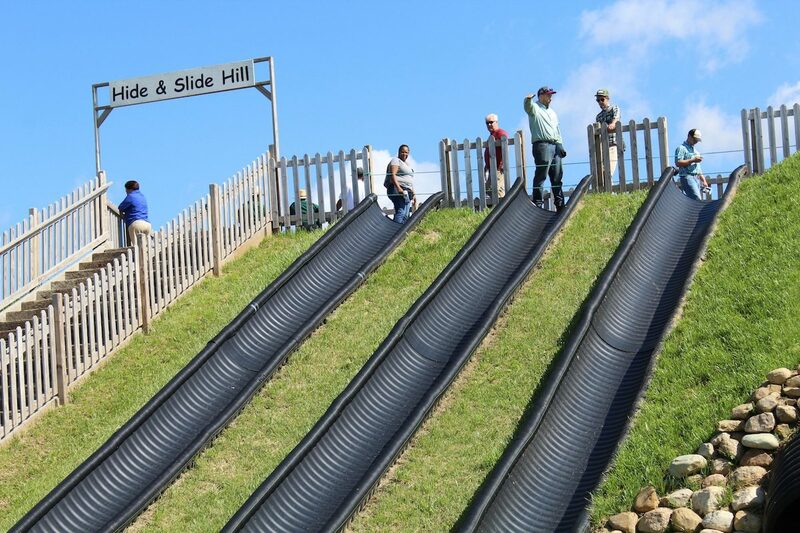 The slides and other entertainment at Ramseyer Farms. This fifth-generation family farm has an extensive history of potato production, and still raises potatoes today for a few select potato chip manufacturers, and for retail sale. But it’s the entertainment side — the corn maze, pumpkins and giant tube slides — that the farm is most known. In 1999, fourth generation farmer Dennis Ramseyer and his wife, Karen, hosted their Sunday school class on the farm, complete with a wagon ride, campfire and good times. “We realized what great fun our urban friends had on the farm, and we also realized that not many of them had farm connections anymore,” Dennis said. At that same time, the Ramseyers were dealing with some difficult market changes in the potato industry, and trying to find a way to make the farm support their family. “We were determined to try to find something else we could do here on the farm to make a living, beyond taking off-farm jobs,” Dennis said. 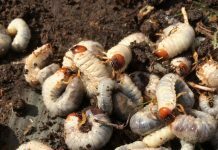 What they found was that they could entertain and make a living by bringing people to the farm, and allow them to experience farm life and fun, at the same time. Although the farm features activities that are entertaining, most of them are directly tied to agriculture and education. The activities are especially popular among school children, of which about 8,500 visited last year. The farm tries to add something new each year. “One of my favorite parts of this job is figuring out what new things we can add,” Karen Ramseyer said, adding that the most important thing is seeing families spend time together. 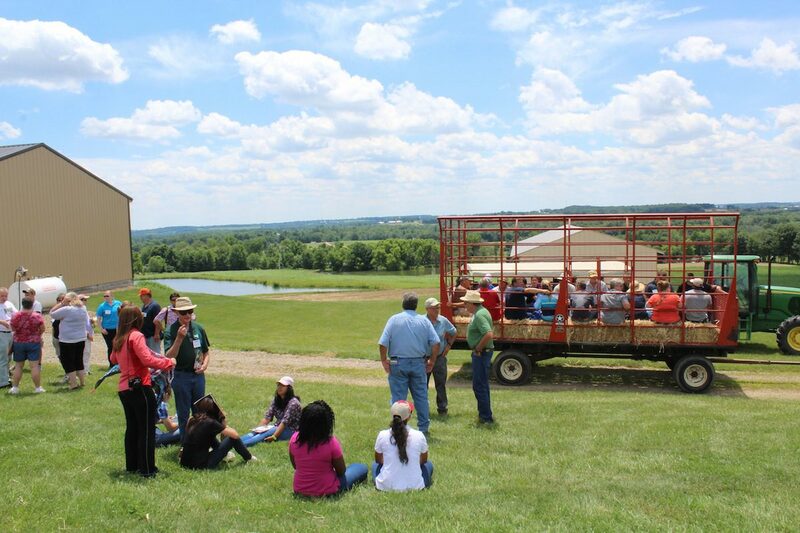 Throughout the morning, employees from the farm and from Ohio State University Extension talked about what it takes to operate a successful ag business and how to deal with the public. About 200 people attended the field day. Rob Leeds, of OSU Extension in Delaware County, said the customer in front of you is the most important person at that time — not the one on the phone or the others in the crowd. Jacci Smith, leading educational session. He also reminded producers that when they bring people to their farm, the experience should conclude as good as it begins. “Not only is the first impression very important, but also the last impression, when they leave the farm,” he said. Leeds spoke alongside Delaware Extension Program Coordinator Jacci Smith, who talked about the importance of social media and monitoring what is being said about your company. Leeds and Smith also said producers need good advertising and signage, if they want people to visit their farm. Most years, Ramseyer Farms is very visible along state Route 585. But this year the farm has made additional efforts with additional road signs to direct visitors, because a major road renovation project has resulted in a detour around their business. Sara Anderson, an office manager at Ramseyer Farms, said an important part of agritainment is making guests feel welcome. It begins with a smile, and gentle approach to the visitors. “We let them know that we’re happy to have them here,” she said. In the afternoon, the group traveled north to Rittman Orchards, where the Vodraska family grows more than 70 varieties of apples, 20 varieties of peaches, and various other fruits and vegetables. Their orchard is located in a hilltop region between Rittman and Doylestown, and is currently in the construction phase of a winery and tasting room. The Vodraskas plan to produce their own wine and hard cider from grapes grown at the orchard, and they’ll offer a tasting room, inside of a 32,500-square-foot facility called Bent Ladder Cider and Wine Works. The family took over the orchard in 2004 and has worked to restore the buildings and fertility of the land. They offer pick-your-own strawberries, raspberries, blueberries, apples and pumpkins, and operate a retail store at the orchard, which has its own bakery. 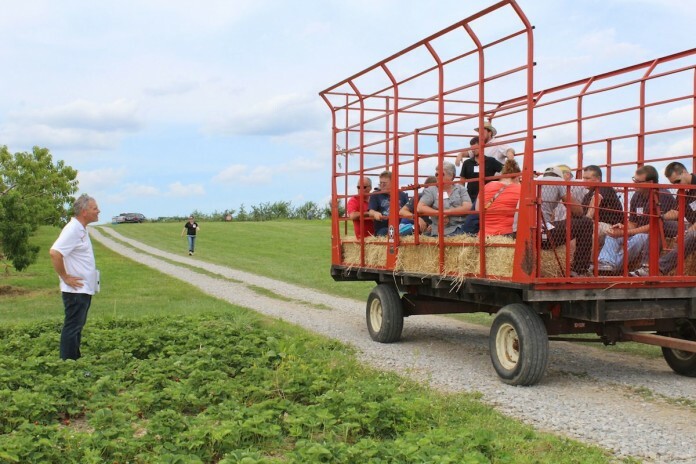 The visit at Rittman Orchards included a lengthy wagon ride, in which various experts discussed the progress of crops on the farm, and across the state in general. Brad Bergefurd, horticulture specialist at OSU South Centers in Piketon, Ohio, said heavy rains the past week have been a challenge for strawberry production, but noted those at Rittman Orchards seemed to weather it fairly well. The OPGMA summer field tour is an annual event that features different produce farms across Ohio each year. Their biggest event of the year is held in January, at the Kalahari Convention Center in Sandusky, where growers and educators gather for annual meetings.